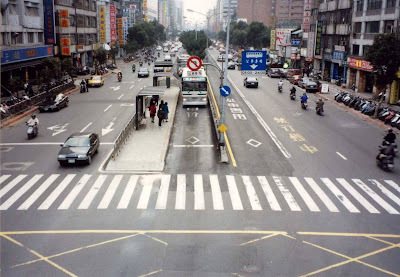 Median BRT does not force users to cross more traffic lanes! This is a follow-up to my earlier post about Delhi's BRT project. Now I do realise that this project may not be a perfect example of the well-proven BRT genre. But some of the arguments being thrown up against it are pure nonsense. When the scheme becomes operational, passengers will be required to cross the road on either side to access the bus stop. In the best of times, this stretch is marked by unruly motorists/scooterists and even more unruly pedestrians. Once they are legitimately given the right to scamper across the road, the ensuing chaos can be easily visualised. Gosh. I don't know where to start on the false assumptions there... So I will stick to my main point. A few years back I heard Walter Hook from ITDP demolish this argument very simply and easily in a presentation to a conference in Agra. The same clarification is made in a report (by RITES) on a 2005 Stakeholders’ Consultation on Delhi's BRT (pdf). It is not hard to understand. THE TOTAL NO. OF LANES OF MOTORISED TRAFFIC THAT A BUS COMMUTER WOULD HAVE TO CROSS IN A RETURN JOURNEY REMAINS THE SAME. It is obvious if you think about it. Without BRT in the median you will cross the whole road once in a journey (your destination must be on one side or the other, right). If your destination is on the same side of the road as your bus stop then you will not need to cross immediately after getting off the bus. But you will still need to cross later to get to the bus stop in order to make your return journey. With median BRT you cross HALF the street at both arrival and departure. But the total lanes crossed is exactly the same as before. Median bus lanes have worked very successfully in many of Taipei's busiest streets since the mid-1990s. Actually, in general it should be SAFER for pedestrians after most median BRT projects are put in place. This is because median refuges (the bus stops) will likely become more common than they were before. So pedestrians will not have to cross the whole street in one dangerous attempt. This enhanced refuge effect should help all pedestrians, not just the bus passengers. Unfortunately the success of BRT has very little to do with median or peripheral lanes. Paris BRT and a few other cities have lanes on the periphery. To call these problems as 'teething' is an understatement. 18 months since start of Pune BRT, beyond a segregated bus lane, no other feature associated with the concept of BRT is in place.